This might have become a real series if the 22nd-seeded ’09-’10 Vancouver Canucks had not blown a 3-0 lead in Game 3, which they eventually lost in overtime. The 6th-seeded ’82-’83 Edmonton Oilers did blow the Canucks away in Game 1, but other than that they’re average margin of victory was only two goals. As the title says, the top line for the Oilers exploded offensively, which is not all that surprising, but most of it did come in a 13-3 Game 1 blowout victory. Mark Messier led the way for that top line with 14 points while Wayne Gretzky finished second with 13 points and Glenn Anderson in third with 12 points. Overall, eight players finished the series averaging at least a point per game for Edmonton. Messier also led the Oilers in goal scoring with eight during the five games. Gretzky was second with five while Anderson was tied with defenseman Ken Linseman in third with four. Anderson and Gretzky were tied for the team lead in helpers at eight apiece while defenseman Paul Coffey was right behind them in second with seven assists. Goaltender Andy Moog had a decent series for Edmonton, but his performance dipped a bit from last round. He posted a 4-1-0 record with a 3.40 goals against average to go along with a .916 save percentage. To nobody’s surprise, it was the Sedin twins that led the way offensively for the Canucks. Henrik Sedin and Daniel Sedin were both tied for the team lead in points with seven apiece. Meanwhile, Ryan Kesler and Mikael Samuelsson were tied for second with five points. There was another tie for the team lead in goals, between four different Canucks. Alexandre Burrows scored three times during the series to tie with Kesler, Samuelsson and (Daniel) Sedin. Kyle Wellwood was the only other Canuck to score more than once with his two goals. Only three other players scored for Vancouver during the five games. Also to nobody’s surprise, the two Sedins were atop the team’s assist leaderboard. Henrik was the overall leader with six while Daniel was tied for second at four with defenseman Sami Salo. This was a tough series for Canucks goaltender Roberto Luongo, but that only makes sense seeing the opponent is an Oilers team from the ’80s. This was by far Luongo’s worst series in his UNP career. He posted a 1-3-1 record with a 4.20 goals against average and a .870 save percentage. Just to show how good Luongo was coming in to this series, his overall GAA and SV% after this series still only 2.57 and .918%. 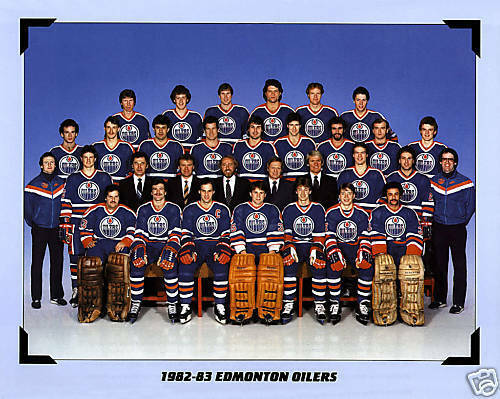 The ’82-’83 Oilers are the third different team to represent Edmonton in the Ultimate NHL Playoff. In each of the previous two tournaments, the Oilers representative has been able to reach at least the Quarterfinal. Now the ’82-’83 Oilers have gotten there and they will face the 19th-seeded ’05-’06 Mighty Ducks of Anaheim, who defeated the 30th-seeded ’85-’86 Hartford Whalers earlier in the Third Round. The ’09-’10 Canucks are in their first UNP and have been able to tie the franchise mark for longest run in the UNP. Last year was the first time that Vancouver had reached the Third Round and they have matched that this year. Up next in the Third Round, the 24th-seeded ’84-’85 Washington Capitals face the 25th-seeded ’09-’10 San Jose Sharks! This entry was posted in 3rd Round, Ultimate NHL Playoff and tagged Alexandre Burrows, Andy Moog, Charlie Huddy, Daniel Sedin, Edmonton Oilers, Glenn Anderson, Henrik Sedin, Ken Linseman, Kyle Wellwood, Mark Messier, Mikael Samuelsson, Paul Coffey, Roberto Luongo, Ryan Kesler, Sami Salo, Third Round, Ultimate NHL Playoff, Vancouver Canucks, Wayne Gretzky. Bookmark the permalink.